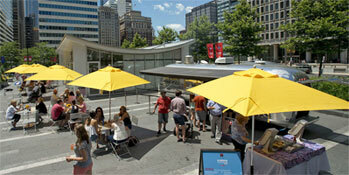 Now Open- The new Dilworth Park Café and Air Grille! Dilworth Park Café & Air Grille are open all summer long, serving up American cuisine made with seasonal, local ingredients. Chef's creations include burgers made with a private blend of all natural brisket, short rib and other steaks, and topped with PA bacon and brie. The menus also include salads made with locally-grown lettuce and New Jersey heirloom tomatoes, hummus blended with PA-made tahini, sandwiches and many other grab-and-go delicacies. Plus, there's ample seating inside the café and outdoors on the PNC Terrace. Stop by and try these great new dining additions to Dilworth Park today! For more information, visit DilworthPark.org/dining/. Get your fill of fresh at this weekly farmers' market, where everything goes right from the dirt to Dilworth. Health is definitely in season, and with an abundance of delicious food direct from the farm, you never know what deals might crop up! Look for products from McCann's Farm, Philly Bread and Mahogany Essentials, along with other special guest vendors throughout the season. Philadelphia's center stage shines every Wednesday afternoon with a showcase of local music. Plus, there's a Sip & Snap Instagram contest, until July 10! Post your photos of CCD Sips at Dilworth Park and you could win food, drinks, concert tickets and more! Click here for details! The week before the Democratic National Convention comes to town, head to the lawn at Dilworth Park for four nights of free outdoor movies about Presidents and politics, to get you in the election year mood. *On these days, Chaddsford Winery will be on site, offering guests wine tastings and the opportunity to purchase a variety of their Pennsylvania local wines, a true "pairing" to the locally-sourced fresh summer menu offered by Logan Square Café. Museum educators will be on hand to show how to be inspired by the different works from the Museum's renowned collection. Art projects will change weekly. Free. Join the Academy of Natural Sciences of Drexel University at Sister Cities Park at 10:30am for fun-filled natural science activities for your budding young scientist! Free.